We had a great Thanksgiving. We invited one of Luke’s buddies from high school who moved out here a few years ago. We slept in then started cooking like crazy! 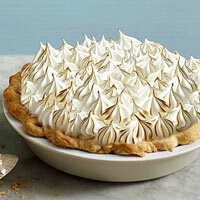 The pie…I made meringue for the first time! We only had a few minor casualties! I’m still amazed that we got everything done and kept hot until dinner time. We were a little later than we had planned for but the food was worth the wait. So, this will be about the 1 billionth Thanksgiving meal that I’ve prepared. My husband usually works the days before and after, making traveling for the holiday impossible. We sometimes have a stragler family member or two that come over but our crowd is usually a small one. This year it will be us and Luke’s grandpa. One nice thing about our small gatherings is that I feel no pressure. When are we eating? When it’s done. What are we wearing? Pajamas, tuxedo’s, I don’t care. Where’s the green bean casserole? At someone’s house who likes it, probably. We’ll wake up, watch the Macy’s Thanksgiving Day Parade, Luke and I will cook, the kids will watch movies and play outside, and Grandpa will still be talking about the election. Turkey. Even though we all hate leftover turkey with it’s weird fridge taste. I brine ours for 24 hours then follow this recipe from Giada De Laurentiis, Turkey with Herbes de Provence and Citrus. It requires fussing over it. If you want to sit back and forget about they turkey, don’t make this recipe. If you want to eat a seriously delicious turkey that tastes pretty freaking awesome, make this one. Dressing. Real dressing/stuffing is so much better than a box. 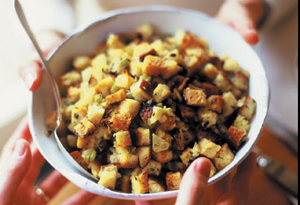 I’m trying this one, Apple, Celery, and Sourdough Bread Stuffing. Cranberries. I make mine, no canned jelly for us. I’m not 100% on this but I think I’m going to make this Ginger-Cranberry Sauce. Rolls. Luke’s mom makes really yummy Parker House rolls, so that’s what I’m going to attempt. I’ve never made rolls. I make bread all the time but never rolls…pray for me. Potatoes. We usually make mashed potatoes but thought we’d go nuts and not, this year. 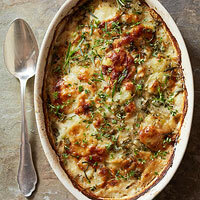 So, we’re making Parmesan Potato Gratin. Fancy. Sweet Potatoes. We usually do dessert-ish sweet potatoes so this year, you guessed it, we’re doing savory. 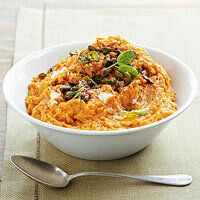 We’re making Goat Cheese Mashed Sweet Potatoes. Veggies. Instead of the ‘traditional’ green bean casserole we’re trying Roasted Brussels Sprouts, Bacon, and Apples. Dessert. I’m only making one pie. Should I make two? Or one pie and another dessert? What would you do?? We’ll only have 3 adults and 3 kids. Anyway, the pie I’m making is Caramel Cream Pumpkin Pie. We will have too much food. I’ll go for a jog in the morning, maybe. I’ll at least run up and down my stairs 5 times, that should help put a small dent in the caloric overload that will be our Thankgiving meal. Then, I will boycot all stores that open on Thanksgiving because I think they are greedy and not at all thankful. What are you making? Are you traveling or are you hosting others? I wanna know what your plans are! !